If you live in Mumbai, Maharashtra & Goa, Gujarat or West Bengal, then Very Soon you will experience a BLUE WAVE at your place. 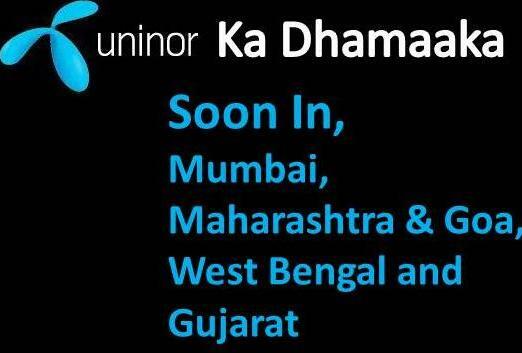 Yes you heard it right, Uninor, a joint venture company of Unitech Wireless and Telenor is all set to expand their global gsm service to all the circles above right from first week of June Company will start rolling its services. The 2 USP’s of Uninor which customers will love it are one that if you purchase your sim kit from any of the official uninor stores then you can choose your last 6 digits of your uninor number as per your choice. To enjoy this facility the charges vary from a Minimum of Rs 100 to maximum of Rs 5,000 depending on the number and yes you heard it right! And for the first time, This sort of an option is available for PREPAID Customers. The second most loved USP of uninor is that it is offering a TRUE LIFETIME VALIDITY to its customer which means there is no liability whatsoever to a customer to recharge his account for Rs 200/6months as stated by other operators. If we talk about the offerings, then uninor will offer its 2 popular GPRS offers which are priced attractively at 2 exciting price points, Rs 9 and Rs 90. With My connect 9, Usage limit is up to 60 MB which is valid for 3 days and with My Connect 90 you can use Up to 3GB with a validity of 30 days. Now you will say, wat’s the new buzz in this, every operator offers almost the same tariff? Uninor provides unlimited access to Facebook, LinkedIn & Twitter for the validity of the plan, which means that you will NOT be charged for Browsing any of these sites out of your FREE usage limit. Note: The schemes which are mentioned below will only be effective in Mumbai Telecom Circle, for rest of all circles offers will be announced after the commercial launch. I gain SMS STV 7: The STV 7 SMS Pack offers all Uninor to Uninor SMS at 1 paisa per SMS. All SMS messages from Uninor to any other network locally and nationally will be charged at 11 paise per SMS. I gain STV 13: The SMS STV 13 pack offers 1,00,000 FREE Uninor to Uninor local SMS. All other local & national SMS will be available at 11p. Post 1 lakh sms, local uninor SMS will be available at 1p per SMS. The STV and its benefits are valid for 30 days. I gain SMS STV 16: After first two paid smses at 50p each (Local or National), 100 Local and 100 STD will be FREE, post free usage customer will be charged at 50p/sms. Apart from above mentioned STV, there is also another STV which is “i save 49 ” STV, in which customer gets 3 benefits which are 1. Free 100 minutes on calls from Uninor to Uninor, local calls at 29p/min, STD calls at 49p/min, 2. First SMS of the day will be charged at 99p and then 2nd SMS will be charged at 10p/sms & 3. FREE 100 Local On-net calls. Note:The benefits of the STV’s can’t be enjoyed while customer roams in Maharashtra & Goa Telecom Circle. There are also FULL TALKTIME Recharges available POST FRC, one of the FULL TALKTIME voucher which is confirmed is priced at Rs 150, in which customer will get a full talktime of Rs 150..
For More, Stay hooked to www.telecomtalk.info ! hey all of ur schemes are best as compared to other operators,but 1 thing that would like to tell is about msg scheme.